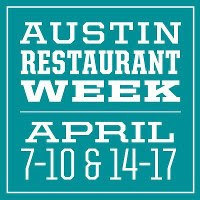 -- Austin Restaurant Week runs April 7-10 and 14-17, with this year's proceeds benefiting Meals on Wheels; check out their website for the listing of participating restaurants. Lots of options for prix fixe lunches and dinners! -- Monday, April 8, Easy Tiger is hosting an 8-course tasting dinner with the brewmaster from Avery Brewing, $100/person. -- Songkran, the Thai New Year celebration is coming up. -- Sway is offering a special menu from April 15 - 21, including duck laksa, Singapore clams, and larp moo, with wild boar, coconut cream, and cashews. Plus, they are now offering valet parking in the evenings. -- The Buddhist temple out in Del Valle, Wat Buddhananachat, hosts a big Songkran festival each year (April 20 this year), with TONS of Thai streets foods available. I always love going, even though I don't know what half the foods are! -- April 25 is the Austin Food and Wine Alliance's annual Live Fire event at the Salt Lick Pavilion. An impressive listing of area chefs are participating in this year's event! Check out their website for tickets ($75) and to see the who's who. -- Tuesday nights are all you can eat mussels at Sagra, including $4 sangria specials. -- Johnny Carino's are supporting autism awareness throughout the month of April. From their press release: "Guests who post to Instagram with the hashtag #carinosblue will join the Johnny Carino’s campaign; the restaurant is hoping to receive 30,000 hashtags to match the $30,000 being donated by Johnny Carino’s." -- If you're itching to get into the food trailer business, come up with a business plan and prepare your best dish on May 4th at the Historic Scoot Inn, for your chance to win a six month contract operating the Zorro food truck, the latest entity from ATX Brands owner Doug Guller. If you want more details, email me and I'll send you the press release. -- Umami Mia Pizzeria (in the old Romeo's on Barton Springs) is shooting for a May opening. The eatery will seat close to 200 total, and in addition to pizza, will feature sandwiches and salads, all of which highlight the umami taste sensation -- savory, rich, and mouthwatering! -- Also in late May, Daniel Olivella's new Barlata Tapas will open at 1500 S. Lamar. -- The Brew Exchange has over 100 beers on tap, and their prices are constantly fluctuating depending on demand; their motto "buy low and drink up". They are also offering beer cocktails, which seem to have fixed prices.